Finding the best chain wallet for yourself is not an easy quest at all. We at Walletisland know that. In this post, we show you amazing chain wallets so your search gets easier. We commonly use wallets to carry some of our most valuable possessions. Important cards, pictures, and receipts cannot be lost, but some need to be kept on us at all times. Our wallet can also be considered an extension of personality, and often becomes something of sentimental value. Different people feel that different wallets are unique and stylish. To help in your search for a stylish chain wallet that suits your personality, we have chosen six of our favorite designs of this season. Before purchasing a new wallet, think about what style you like – long wallets are handy if you collect receipts, or need to carry a checkbook; a bi-fold wallet fits nicely in the back pocket; a tri-fold wallet may have room for more storage. What color do you like? Do you prefer real leather, or a synthetic fabric? Do you prefer an open seam or a zipper? How many card slots do you need? Regardless of style and color, the wallet you choose needs to suit your lifestyle, and be durable enough to last. A wallet is not only an extension of your personality, but an investment, and a purchase you should feel confident in. Chain wallets in particular can give a unique look to a man’s appearance while also adding security of his valuable possessions. Read on for our top picks of the best chain wallets available today. Here’s a simple overview of the chain wallets we’ll cover. The term wallet was first used in ancient Greece, to refer to the personal belongings that a person carried around. In the 1600’s, the pocket sized wallet was invented. Its purpose was to hide a person’s private belongings, money, and anything else that they did not want to be visible to others (read the whole wallet history). Today, the use of a wallet is still extremely popular, and they are available in many colors, styles, and fabrics. No matter which style we prefer, a wallet with a chain is a good buy for anybody because the chain serves to keep your wallet or keys safe and secure from loss or theft. 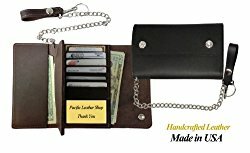 If you are an active person, travel often, take your wallet out often, or are worried about thieves and pickpockets, a chain wallet will give you an added feeling of security while also providing a unique, trendy look to men’s fashion. We hate lost wallets, and the wasted time we spend looking for them when we didn’t need to lose them in the first place. Chain wallets are not only for bikers, truckers, and punk rockers. Men from all over are opting to purchase chain wallets because they can compliment any style, in addition to offering many safety features. Now that you have decided to purchase a chain wallet, what style should you choose? Our favourite wallets come in many different designs and dimensions, but we love chain wallets that are made with genuine leather. We feel that choosing to invest in a genuine leather wallet is a wise decision because it is a natural and durable material that may last you for years if properly cared for. When we chose our favorite chain wallets available today, we also wanted to take a look at the different wallet designs available. Most chain wallets can fit into one of three categories: bi-fold, tri-fold, and checkbook. Bi-fold wallets are the most commonly owned wallet. They are designed to carry cards and paper money, and fold once, in half. The bi-fold is a basic design for men who choose simplicity. They often do not feature a coin pocket, though some have a small zippered or button closing pouch. These wallets lay relatively flat, so are comfortable to carry in pants pockets. Although the bi-fold style is simple, there are many style options that provide extensive organization and storage. Tri-fold wallets are similar to bi-fold wallets, but this design folds into thirds. Cards are stored vertically and paper money lies flat. Often they contain a small coin pouch as well. Tri-fold wallets tend to be on the smaller size, but are thicker when closed. This needs to be considered when thinking about where you are going to carry your chain wallet. These styles are long enough to hold a checkbook and a larger amount of cards. It is common for them to contain a coin pocket. Checkbook wallets are sometimes referred to as secretary wallets, and were originally designed to fit into the inner breast pocket of a man’s suit. They offer added storage for those who need to store and carry important receipts or other documents. No wallet is too big or too small, if it suits your needs and lifestyle. When you are choosing the best design for your needs, think first about what you will be putting into your wallet on a daily basis and how you will carry it, then try to match your choice with as many other desired features as you feel are necessary. Now, it’s time for the full review. 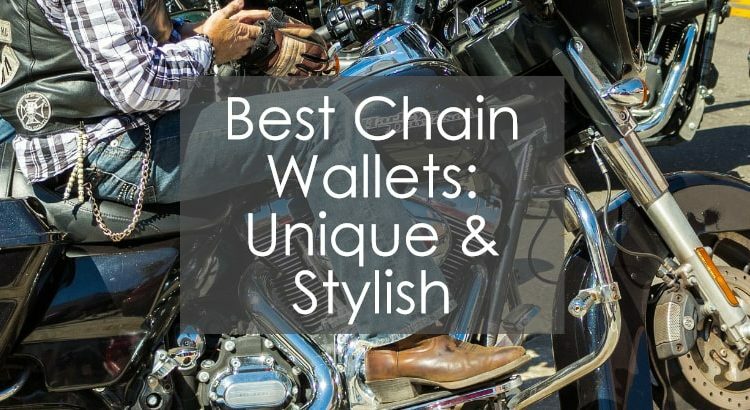 Here we’ll take a detailed look at chain wallets that are top-rated in their categories. Summary: Our opinion is that this is a unique chain wallet style, that can easily be worn with jeans or dressed up because of its vintage style. Despite some concerns with the size of this chain wallet, we recommend it overall, and rate it a four out of five. 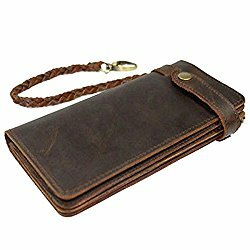 The hand made bi-fold chain wallet from Itslife is made with premium brown cowhide leather, this bi-fold wallet features six card slots, one zippered pocket, and two money slots. Dimensions are 7.4” x 3.8” x 1”. This wallet boasts a worn, retro leather look, that holds scars and scratches as beautiful characteristics of the authentic fabric. It is a dark brown fabric that looks lighter, and worn at the edges, with matching light brown stitching. There is a snap closure on the exterior. The braided leather chain makes for a man who can dress with style without making noise. The inside closure flap has 6 card slots. This folds over onto an accordion style, three section compartment, one of which sections is secured with a zipper closure. Positive reviews of this product report beautiful, high quality leather, solid and strong stitching, and impressed opinions of the leather chain. We like that the cards can be kept visible and separated with this design, and you still have a zippered pouch for change. We also love the worn leather. Some unhappy customers reported that they felt the wallet is too big or bulky, and one customer complained about a broken snap. Summary: Overall, we love this wallet and are happy to place it on our list of the most stylish and unique chain wallets available today. We rate this wallet a four out of five. The glazed genuine leather wallet, with metal zip around and chain is made of strong, genuine, natural leather, inside and out. It is reddish brown in color and measures 4.9” x 3.9” x 0.85”, with an almost 18 inch chain. The entire wallet zips shut with a thick zipper. Happy customers report that the wallet appears well made and that they feel it will last for years. They love the secure chain and zipper closure, and the organization that the wallet allows for. We love the style of this wallet, but feel it would be hard to dress up for formal occasions. We also love the all leather construction, and that it has a snap pouch inside for change. One customer reported that the chain is slightly too short. Summary: Although this wallet looks great, and we love the distressed black leather construction, we think it is not very practical for anyone who may need a lot of storage in their wallet. Actual reviews, however, were very favorable of this wallet design. We rated this wallet 3 / 5. 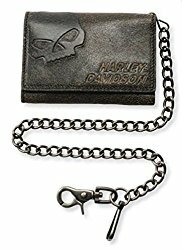 This Harley-Davidson Men’s Burnished Tri-Fold Willie G Skull Biker Chain Wallet. Is made of distressed, genuine leather that is black and distressed looking. It is complete with the licensed Harley Davidson script and a embossed and buffed skull logo. The chain is 19 inches long and made with antique nickel. It secures to items with the attached lobster claw style clip. Dimensions are 5.5 inches by 4 inches. 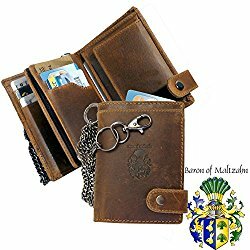 Summary: The Baron of Maltzahn Bloomberg brown leather wallet with detachable chain is once of our favorites – we had to give it a 5 / 5. We love the design and scratched, brown leather that this wallet offers. We think that this may be the most stylish choice of wallet that offers the most storage and a unique look. Dimensions of this wallet are 4.7 x 3.5 x 1.2 inches. The wallet has many features including a secret outer compartment, a large coin compartment with a card slot, two inner flaps, twelve additional card slots, two large mesh pockets, two bill compartments, and a carabiner for belt loop attachment. This leather is manually processed, and the wallet is made with high quality metal finishing. In actual reviews, one customer complained that the chain was awkward and could not clip properly to his pants, however, we think that the chain could be easily replaced for an overall good investment. The customer also complained that the mesh on his wallet tore, which may be something to consider. 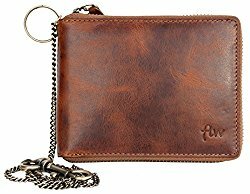 Summary: This genuine cowhide wallet is made in the USA, and features six card slots with a window, four pockets, and a twelve inch chain with belt loop attachment. Overall we highly recommend this style and rate it a 4 / 5. Dimensions are 7 1/8 x 4 5/8 inches, and the wallet is a dark reddish brown color. This wallet offers a more updated version of the classic biker or trucker wallet, with additional storage, and a snap front closure for added security. This wallet is made to be long lasting and durable, and will not crack, peel, or fall apart. The wallet guarantees to be genuine leather, and will outlast many other wallets. We love the simplistic design of this wallet and feel that it is a stylish addition to any man’s wardrobe, although some men may feel it is too simple. One real reviewer complained that the wallet was too wide to fit in his back pocket, however other reviewers felt that the width was a positive thing, allowing for more storage of important documents and items. Another reviewer felt that the wallet was not durable enough. Summary: This unique wallet design from D’SHARK is handmade with genuine leather by skilled craftsmen. 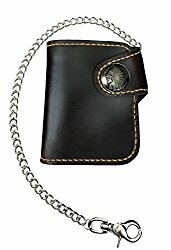 The wallet is dark brown in color, with an Indian head stainless steel plated snap closure on the front. The wallet features two cash compartments, a zippered coin compartment and a modern credit card slot. Overall, we rate this wallet a 3 / 5. Approximate dimensions are 5.25 x 4 inches. The wallet may vary from pictures because of it’s unique handmade quality. The leather is carefully selected before production, and the craftsmen work hard to ensure that every wallet is of complete high quality. To add to this wallet’s design, a whip stitch around the edges of this wallet complete the look. Verified customers rave about this wallet’s craftsmanship and durability. We love the soft yet sturdy leather, too. One customer, however, complained about the durability of the chain, but the problem was easily resolved with a replacement. Couples everywhere are fighting over lost wallets – right now. Husbands scatterbrained, wandering around the house, while wives angrily suggest where to look. In another place, a man has just had his wallet stolen, or perhaps he put it down somewhere and forgot it? Both of these situations could have easily been avoided, had these men chosen to purchase a chain wallet instead of a regular wallet. The wallet could have been secured to their pants, allowing them to spend their times in better ways than looking (again) for their lost wallet. We highly recommend chain wallets because of their added security and the unique fashion statement that they make. You have a lot of options when choosing your new wallet – What kind of fabric do you like? What color best suits you? What design is best for your lifestyle? How much storage do you need? Do you need added security features? Compare our favorite chain wallets to find a style that best suits you. Still not sure that a chain wallet is for you? Check out our review of standard bifold wallets (standard back pocket wallets for men) for some more great options. We are sure that you will find within our favorites, the most stylish and unique wallet out there to compliment your unique look and give you the added security that you need.